I love Thanksgiving dinner with all the sides and leftovers but there comes a time when I just can't eat another bite of turkey or stuffing. I begin to crave other things like cheese, beef or even a salad! I could also title this post, "How to make something healthy like a salad, unhealthy", but we'll stick with what I have. 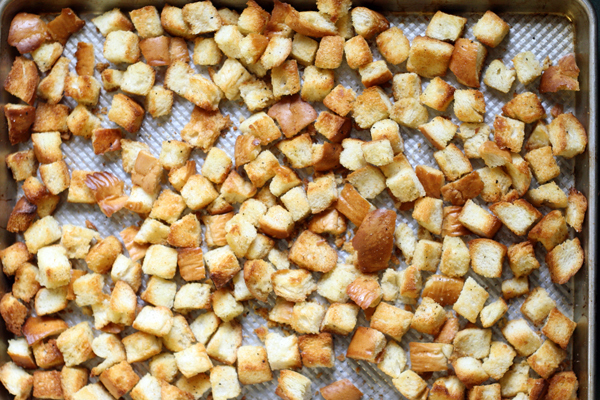 That said, I love homemade croutons. They are fresh, flavorful and the perfect crunch on a salad (or by themselves). They take a little more time than opening a box, but once you try them, it's worth it. I'm about to shock you now, the recipe I use is from my pal, Martha. She shows it with her Caesar salad dressing recipe which happens to be my all-time favorite dressing recipe. It reminds me of the Caesar salad at Tulsa's Celebrity Restaurant. Yes, it's that good. Anyway, back to the recipe. This is easy stuff folks. 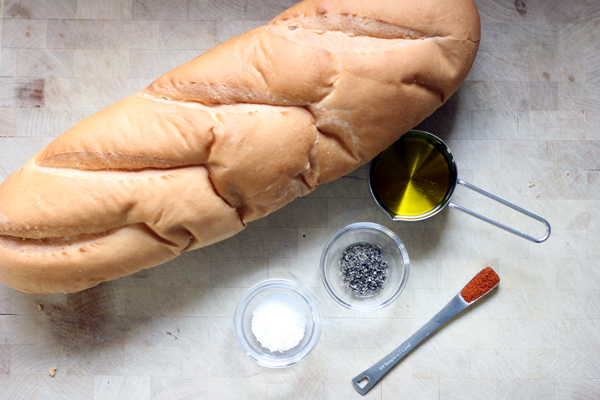 A loaf of French bread, or Italian or some other big ol hunk of bread. 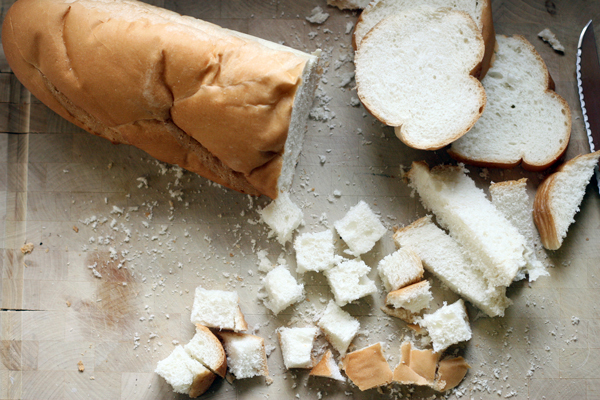 Martha suggests cutting off the crust by I actually prefer leaving it on (plus it's takes less time). 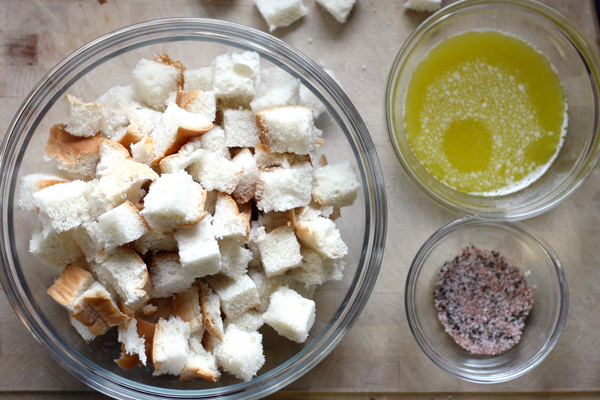 Drizzle the bread with oil and butter and sprinkle the seasonings all over and toss to coat. Bake for about 6 minutes at 425 degrees, stir around so all edges get a little crispy, put back in the oven and cook another 5 minutes or so until browned. Let cool (or don't and just grab handfuls to enjoy while warm because you won't be able to help yourself when you smell them) then top your salad. 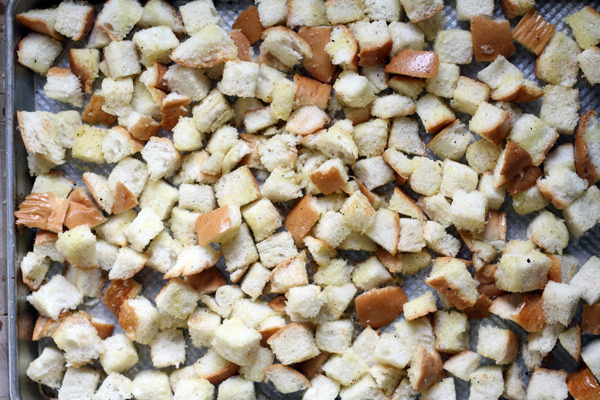 These croutons are amazing with the Caesar salad dressing. I don't have pics of that but you'll just have to take my word for it. these look great. love the new look of your blog!